This may be a tough pill to swallow, but I’m just going to come out and say it. You will not become wealthy working only 40 hours a week. There’s good chance you’ve read or at least heard of Tim Ferriss’s ‘4 hour work week’. I remember reading that book a few years ago. It lit my mind on fire. But it also twisted reality for me a touch. I became obsessed with working less. Working smarter rather than harder, but still working less. While you certainly can become a millionaire and at some point put everything on autopilot, it still requires a GREAT deal of bumping, grinding & overtiming. To become wealthy, you’ve got to put in the time and effort. And then you need to be smart with that money and place it into assets. Such as an investment portfolio. Generate more money for your investment portfolio by finding a better paying job, working more at your primary gig, or developing a side hustle. A side hustle or second job is probably your quickest way to generating additional cash flow. Here a few suggestions that you can implement right now to begin generating some more income for your investment portfolio. You may not hear this suggestion too often, but may people bring in substantial money playing cards. I know a few individuals who even travel the world doing it full time. It takes a bit of time to develop this hustle to a full time point. But for many people with a brain, they can get in the green quickly. I only suggest you invest you your willing to lose and avoid the rock star lifestyle that can accompany this game. With the ease of online casino sites, you can start whenever and play whenever, from wherever. Definitely something to think about. If you are a native English speaker, there is a huge opportunity for you to put your mother tongue to work. A large part of the world whom are interested in learning English are now looking online for tutors. There are tons of companies you can work for, teaching English, right from the comfort of your own home. You don’t need to fly across the world and live in a foreign country anymore to teach ESL. And it’s incredibly easy to get started. They say there are a million ways to make a million dollars. It could also be said theres a million ways to make money online with via blogging. Seriously, avenues to profit from having a website and loading content on it are endless. There’s a bit of up front work required before the cash starts rolling in, but once the ball is rolling this can be an incredibly lucrative side venture. Visit my series on starting your own website/blog for more information. Services like Fiverr, PeoplePerHour, Upwork and Gigbucks are all options to earn a little side money on skills you already possess. Photography, graphic design, social media management, copywriting/content creation. These are all skills people will pay for. And more! I am confident nearly everyone has some sort of skill that, if marketed correctly could be profitable. These are small little daily adjustments you can make that will add up. You’re probably already on the internet all day, googling this and that multiple times daily. Why not earn a little cash while doing it? Qmee is a simple plugin you add to your interest browser. You can rack up real money while searching on the internet and various deals and promos come up as well when you visit different sites. So if you go to Amazon looking for a new phone charger, BAM. You may end up getting the best deal offered to you through Qmee. Ebates is similar, shop through their website and on your account, and you’ll get money back on whatever you purchase. As minimalistic as you may be, we all need to purchase some basic stuff, might as well get some cash backon it. If you know anything about websites and blogs, you can get paid decent money to provide feedback on various websites. Usually the tests take about 20 minutes and you can get $10 USD per review. 30 bucks an hour is pretty damn respectable! 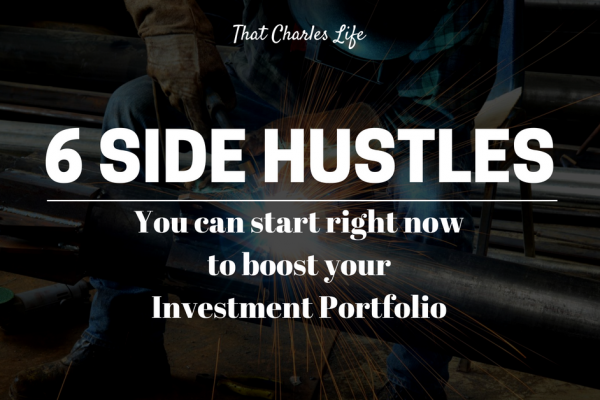 Which side hustle will you use to boost your investment portfolio? There are so many ways to rake in some extra dough each month to boost your investment portfolio. Gambling, teaching English online, blogging and other online work are just a few of the many ways. The great thing about all these side hustles, is most of them can be done from anywhere in the world! Talk about side hustle to full time gig. Do you have a side hustle? Did I miss your favorite way to make extra cash? Please let me know in the comments!